International Pen have designated the 15th of November as the Day of the Imprisoned Writer and are highlighting the plight of five writers currently imprisoned for their writings. I’m contacting you on behalf of the Irish Pen/WORD Freedom to Write Campaign. 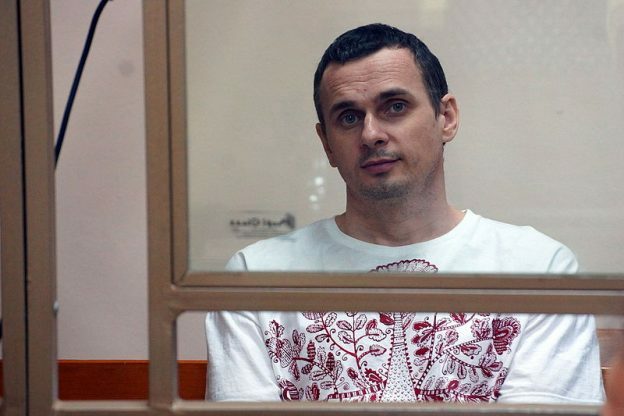 We have decided to highlight the plight of Ukrainian writer and filmmaker, Oleg Sentsov. Oleg is serving a 20-year prison sentence on ‘terrorism’ charges after a trial by a Russian military court, marred by allegations of torture. He is currently being held in the ‘Polar Bear’ penal colony of Labytnangi, in Siberia, thousands of kilometres away from his home and family in Crimea. He recently spent 145 days on hunger strike, calling for the release of all Ukrainian prisoners imprisoned in Russia on politically motivated grounds. He ended his strike on 6 October 2018 as he feared being forced-fed. Return all Ukrainian nationals arrested in Crimea and now held in Russia to Ukraine, as required by international law, and free all held solely for the peaceful exercise of their right to freedom of expression. The Irish Freedom to Write campaign and Irish Pen believe that Oleg Sentsov was imprisoned solely because of his opposition to Russia’s occupation and illegal ‘annexation’ of Crimea. We call on the Russian authorities to release him immediately and to respect Oleg Sentsov’s human rights, including the prohibition of torture and other ill-treatment, and his right to medical attention. We further call on the Russian Authorities to free all who are held solely for the peaceful exercise of their right to freedom of expression and to return all Ukrainian nationals who are currently held in Russia to Ukraine, as required by international law. Further information on the plight of Oleg Sentsov is available below in the PEN International appeal. Please email June Considine juneconsidine@gmail.com to have your name added to our letter. Ukrainian writer and filmmaker Oleg Sentsov, is serving a 20-year prison sentence on spurious terrorism charges after a grossly unfair trial by a Russian military court, marred by allegations of torture. He is currently being held in the ‘Polar Bear’ penal colony of Labytnangi, in Siberia, thousands of kilometres away from his home and family in Crimea. He recently spent 145 days on hunger strike, calling for the release of all Ukrainian prisoners imprisoned in Russia on politically motivated grounds. He ended his strike on 6 October 2018 as he feared being forced-fed. PEN International believes that Oleg Sentsov was imprisoned for his opposition to Russia’s occupation and illegal ‘annexation’ of Crimea and calls on the Russian authorities to release him immediately. The organisation further calls on the Russian authorities to respect Oleg Sentsov’s human rights, including the prohibition of torture and other ill-treatment, and his right to medical attention. We also encourage you to reach out to your Ministry of Foreign Affairs and diplomatic representatives in Russia, calling on them to raise Oleg Sentsov’s case in bilateral fora. The amount of support Oleg Sentsov received during his hunger strike was staggering. We are grateful to everyone who sent him messages of solidarity and would like to encourage you to keep writing to him. After this hunger strike, and the toll it has taken on his health, we are sure he needs our support now more than ever. Dear Oleg, I wish you good health and strength and hope that you will soon be released. We are all thinking of you and stand with you in solidarity and respect. Дорогой Олег, желаю Вам крепкого здоровья и сил, и надеюсь, что Вы скоро будете освобождены. Мы все думаем о Вас и поддерживаем в знак солидарности и уважения. Celebrate Oleg Sentsov’s work through film screenings and readings. Please let us know about your activities and send us reports about the actions you take. This is really important as it means we can monitor the impact that our campaigning has in relation to Oleg Sentsov’s case. Share information about Oleg Sentsov and your campaigning activities for him via social media. Ukrainian writer and filmmaker Oleg Sentsov took part in the EuroMaidan demonstrations that toppled former Ukrainian President Viktor Yanukovych in February 2014. He helped deliver food to Ukrainian soldiers following Russia’s occupation and ‘annexation’ of Crimea in March 2014. He said he was arrested by the Russian security services at his apartment in Crimea on 10 May 2014. He reported being subjected to a brutal three-hour ordeal involving beatings, suffocation and threats of sexual assault. His arrest was officially recorded on 11 May 2014 on the grounds of ‘suspicion of plotting terrorist acts’ and membership of a terrorist group – the Ukrainian right-wing group Pravyi Sektor (Right Sector). He was taken to Russia on 23 May 2014 where he spent over a year in pre-trial detention. He was eventually charged with the establishment of a terrorist group, politically motivated arson and conspiring to blow up a statue of Lenin, all of which he denied. Following a trial widely condemned outside of Russia, in which a key prosecution witness retracted his statement, saying it had been extracted under torture, Oleg Sentsov was found guilty and sentenced to 20 years in prison by the military court of Rostov-on-Don on 20 August 2015. His sentence was upheld on appeal on 24 November 2015. In October 2016, the Russian authorities denied a request for extradition to Ukraine on the grounds that he had become a Russian citizen following Russia’s occupation and ‘annexation’ of Crimea. Oleg Sentsov began a hunger strike on 14 May 2018 to urge the Russian authorities to release all Ukrainian nationals currently imprisoned in Russia on politically motivated grounds. He was taken to intensive care on 15 June 2018. His heart and kidney problems considerably worsened and he was put on a glucose drip. In August 2018, he told his family that he had been denied access to letters and had been kept in ‘an information vacuum’. The prison authorities subsequently granted him access to correspondence following an international outcry. On 5 October 2018, he wrote a letter stating that he felt compelled to end his hunger strike as he feared being forced-fed. He said he had lost 20 kilos and suffered irreparable damages to his health. Scores of international and regional officials and organisations have called for Oleg Sentsov’s immediate release, including United Nations experts, the European Parliament and the Organization for Security and Co-operation in Europe. Svetlana Alexievitch, Tom Stoppard, Margaret Atwood, Ian Rankin, Ken Loach, Mike Leigh, Stephen Fry and Yann Martel are amongst those who most recently joined PEN and voiced their solidarity with Oleg Sentsov. Oleg Sentsov is the winner of the 2017 PEN/Barbey Freedom to Write Award and the 2018 European Parliament’s Sakharov Prize for Freedom of Thought. For more information about the state of freedom of expression in Russia, please see PEN International, PEN Moscow and St Petersburg PENs joint report entitled Russia’s Strident Stifling of Free Speech 2012-2018. The report, published in October 2018 in both English and Russian, shows how Russia’s array of repressive laws severely restricts the rights to freedom of expression, opinion and information. It describes the deterioration of media freedom through the Russian authorities’ control of the media landscape and the immense pressure faced by independent journalists to not contradict the official line or provide coverage of critical viewpoints. It analyses the prosecution and conviction of several people on politically motivated grounds. It further shows how artistic freedom and literature are under threat. For more information about freedom of expression in occupied Crimea, please see PEN International’s report Freedom of Expression in Post–Euromaidan Ukraine: External Aggression and Internal Challenges, published in September 2017 in English. PEN International continues to call for a peaceful resolution to the conflict in Ukraine. This entry was posted in Freedom to Write, Press Releases and tagged Freedom of expression in Russia, Oleg Sentsov, PEN Moscow, St Petersburg PEN on 10 November, 2018 by Vanessa O'loughlin.